Parkinson's disease (PD) remains one of the most elusive problems in medical science. Despite all the progress the field has made in recent years, in the vast majority of cases we still don’t know how it starts, what effects its development, and why it looks and feels so different from person to person. More importantly, after billions of dollars and countless hours spent in labs all around the world, we still don’t have any therapies that can modify disease progression. In a paper in Trends in Neuroscience authored by Dr. Michaela Johnson, myself (Benjamin Stecher), Prof. Viviane Labrie, Prof. Lena Brundin and Prof. Patrik Brundin, we have proposed a possible explanation for our inability to make sense of PD. We believe that part of the reason is that we have spent decades studying Parkinson's as though it were a single disease with a single cause. To this day labs researching PD still do all that they can to reduce the amount of variability in their models to try and study this as if it were one disease. But walk into any room of people with PD and you will see a wide variety of different symptoms, from tremor to shuffled gait to rigidity to stooped posture to frozen faces, to some unique combination of all of the above. And, if you talk to them about their disease you would hear about chronic pain, sleep disorders, speech problems, hallucinations and much more. How can one disease possibly explain all this variety? What we propose is that this is not one disease, but rather a cluster of different disorders that have been lumped together under the broad label of Parkinson's disease. But we are not the first to suggest that Parkinson’s is an umbrella term for a number of disorders. What we propose that is new is that we believe the factors that lead to these diseases can be divided into three categories which we have called triggers, facilitators and aggravators. These factors correspond with different stages in one’s disease and categorize the chain of events that cause Parkinson's disease and its progression. "Triggers" are the spark that kicks things off. They often take place decades before symptoms develop, and may start in the gut or the nose following an exposure to certain pesticides or infections. However, most people exposed to these triggers will never develop Parkinson's disease because they don’t have a "facilitator". Facilitators enable the initial trigger to cause further damage, examples include chronic inflammation or certain genetic mutations. If triggers are the spark, facilitators fan the flames. Finally, in order for this harmful process to really snowball an "aggravator" is needed. Aggravators, as the name implies, aggravate the disease process and enable it to cause further damage and spread through the brain. Note that these three stages do not have hard boundaries between them and some factors may fall into more than one category. Also, there are likely a large number of different triggers, facilitators, and aggravators. 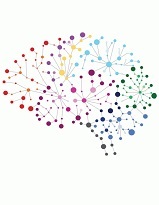 This variety may explain why we see so many differences in people with Parkinson's disease as there may be dozens, if not hundreds, of different combinations that each result in a different set of symptoms and unique disease progression. This categorization of Parkinson's disease into three time-dependent phases has important implications for how we treat Parkinson's disease. If we want to stop the disease early on then we ought to consider targeting triggers or facilitators. But for those that have already developed symptoms the most effective therapies could be those that silence the aggravators of this disease. It is likely that what we have proposed is incomplete, the categories may still need to be refined, and there are probably going to be sub-categories and exceptions that we have not yet been able to account for. What we hope is that this will lead to a more nuanced understanding of this disease, and eventually, therapies that have a better chance of modifying progression. Our proposal also implies that we will need a wide variety of different therapies and each will need to be applied to the right patient sub-group, and to the appropriate disease stage if they are going to be effective. While this does add another degree of complexity to how we treat Parkinson's disease and how we design clinical trials, it may be vital to actually modifying the progression of the disease in each individual. Going forward we will need to find ways to test the triggers, facilitator and aggravators hypothesis. We hope this will spark some innovative thinking and novel experiments that will get us closer to the treatments that are so desperately needed. 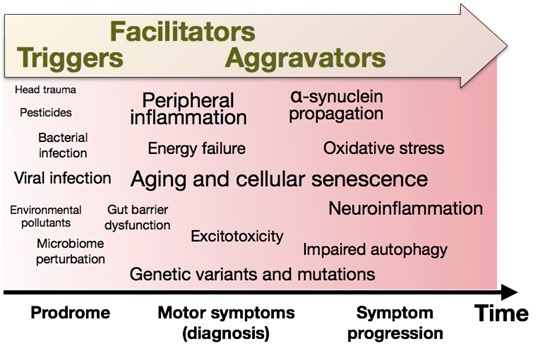 –Published open access study: Michaela E. Johnson, Benjamin Stecher, Viviane Labrie, Lena Brundin, and Patrik Brundin (2019) "Triggers, Facilitators, and Aggravators: Redefining Parkinson’s Disease Pathogenesis", Trends in Neurosciences, published 1 Jan 2019 (DOI: 10.1016/j.tins.2018.09.007). –Banner image source: go here. Keep an eye out for more entries in this section soon, and go here to view all Benjamin Stecher's unique blog posts for JPD! See all entries his Tomorrow Edition blog on that website here.